This year at SHOT Show we stumbled upon the Olympic Arms booth. Olympic Arms focuses on AR-15s and two types of pistols – the Whitney Wolverine and 1911s. When it comes to AR-15s, they have it all. AR-15 pistols, carbines and rifles with all the accessories, too. Olympic Arms is known for their innovation and quality. We were impressed with their wide variety of price points from entry levels AR-15s at $600 to models that cost just over $1,000 with upgraded accessories. Olympic Arms manufactures a line of pistol caliber models that use 9mm, 10mm, 40 S&W or 45 ACP. MSRP at your local gun store for these models would be right at $1,000. Olympic manufactures this AR-15 platform with a 16″ barrel and a standard AR-15 lower receivers that accept their polymer pistol caliber magazines. The Gamestalker AR-15 rifle quickly got our attention. The Gamestalker models come in .300 OSSM, .243 WSSM or .25 WSSM calibers with a 22″ stainless steel fluted barrel with a muzzle crown. There are several options and the price point is about $1,300 for this rifle. The gun is an aluminum forged receiver in black or camouflaged. These are gas operated rifles with semi-automatic actions. I prefer the flat top upper with the picatinny rails. The hand guard is a free-floating slotted aluminum tube and they use an ACE FX Skeleton Stock. The firearm weighs 7.5 lbs and would be perfect for hunting. The long barrel allows the magnum calibers plenty room for the powder to burn giving you more than enough velocity for the kill shot. Don’t forget you get the ERGO sure grip and one 5 round magazine, too. In addition to the AR-15 platforms, we were intrigued by the Whitney Wolverine .22LR pistols by Olympic Arms. This pistol is a revival of the 1950s version by Robert L. Hillberg. Olympic Arms makes the firearm with a polymer frame and ventilated rib, but keeps the magazine shell metal for strength and durability. These are lightweight and fun to shoot. They are offering the gun in four colors – black, desert tan, coyote brown and PINK for the ladies. Specifications include a 4.625″ barrel with a blade type front sight and a dovetail rear sight. It comes with a 10 round magazine and black checkered grips on all models. The length is 9″ and empty it weighs about 19 oz. MSRP for this is just under $300. Amy wants one in Pink and Danny will be getting the solid black version. This little .22LR will make for a fun day at the range. And a pink Whitney Wolverine isn’t the only offering for a lady. 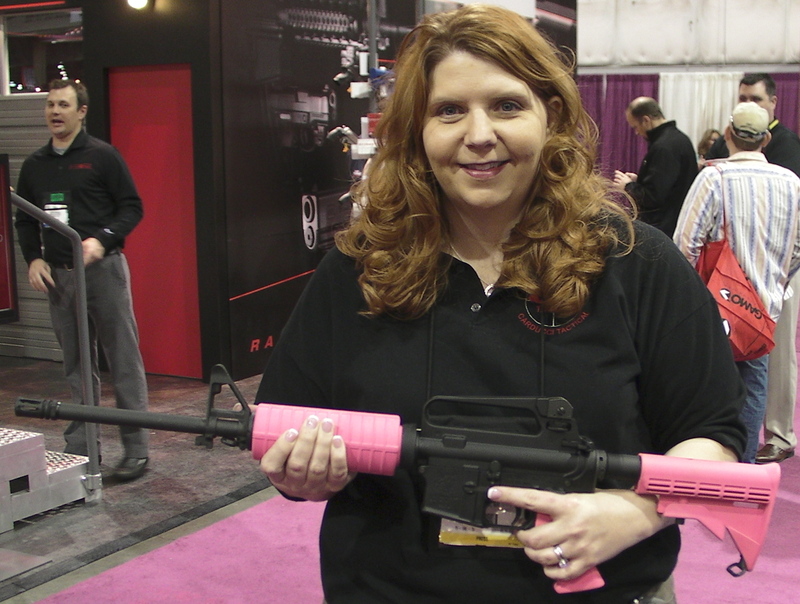 They have pink AR-15 carbines for women shooters and hunters. Amy couldn’t resist checking it out and was impressed with the weight and the quality of the firearm. Next time you are at your local gun store, ask to see the offering from Olympic Arms. For more information, you can check out their website. For more pictures, check out our Facebook page. See you on the range! This entry was posted in For Women, Gun Reviews, Hunting, SHOT SHOW 2012 and tagged .22lr pistol, Amy Carducci, ar-15, ar-15 for hunting, ar-15 rifle, danny carducci, guns for women, olympic arms, pink ar-15, pink guns, pink pistols, whitney wolverine pistol. Bookmark the permalink.